As Tippi Hedren stood on the Redford Theatre stage on September 28, 2012, an angle of light on her face gave me a glimpse of the younger Tippi whom I had just seen in the first half of the Redford’s screening of the 1963 Alfred Hitchcock thriller The Birds. It was one of many times that evening that the past and present versions of Tippi Hedren intermingled for myself and maybe many other Redford visitors. It was intermission, and Tippi was helping with the drawing for the always popular 50-50 raffle. 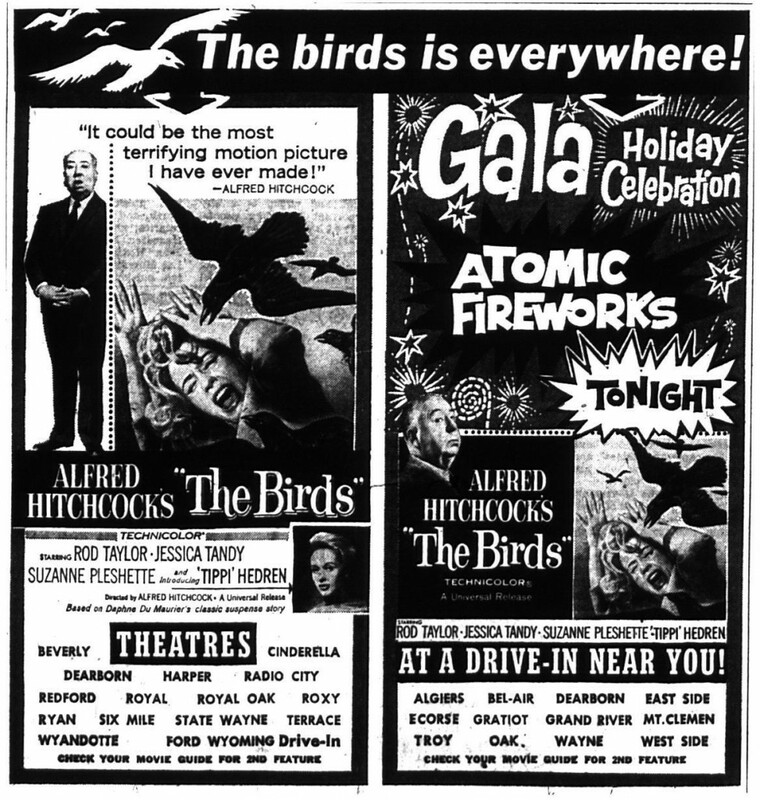 Most evenings, there might be one $100 prize for a lucky audience member, but the turnout for Tippi and The Birds was so large that five $100 prizes were awarded, along with a Birds-related t-shirt. Many people have Tippi’s portrayal of Melanie Daniels etched in their minds, but here was another, equally significant, image. Tippi was 50 years older than she was in The Birds, advancing in time, just like the rest of us. Part of the appeal of the movies is how they preserve moments in time. Also, they give us the chance to project ourselves onto the screen, living vicariously through characters, in the helpful privacy of the dark theater. These factors were at play on that Friday evening at the Redford, as the audience constantly juggled the fictional image of Tippi on the screen with the real life image of Tippi on the Redford stage introducing the film and answering questions. Her physical presence in the theater made us feel closer to her character on screen. So when we saw Melanie Daniels on screen, we knew were also seeing an experienced television model acting in her first movie, after Fate had decided that Alfred Hitchcock and his wife Alma would notice Tippi in a T.V. commercial one morning while they were eating breakfast. And when we saw Tippi Hedren on stage, we knew we were also seeing a wife, a mother, an animal rights activist, and a still-active actress. Tippi also appeared in the front lobby, signing autographs for a line of people that stretched into the concession lobby and up the balcony stairs. Tippi has become a curator of the legacy of The Birds, which last played at the Redford in October 2006 (Trapped on the Big Screen). She’s helped people understand the helpfulness of fellow actors Jessica Tandy, Rod Taylor, and Suzanne Pleshette during the filming of The Birds. At the Redford, she described the challenges of creating Hitchcock’s unsettling masterpiece of terror. For example, Tippi was surprised one day with the news that the mechanical birds weren’t working for the scene in the upstairs of the house, so she ended up spending the next five days having real birds thrown at her. Tippi also talked about other parts of her life, especially her work as an animal rights activist in California. She compared the working styles of Alfred Hitchcock and Charles Chaplin, who cast her in his last film, A Countess from Hong Kong (1967), which also starred Marlon Brando and Sophia Loren. “Hitchcock was very quiet on the set. He was so very, very well planned and organized. He was finished filming at 5 o’clock. At 5 o’clock, we had the martini shot, and it was over. That’s very rare in Hollywood. “With Charlie, it was so amazing to work with him. I wish they had had a second unit camera on him because the way he directed was he would take any one of the scenes—sometimes Marlon Brando and I were in it, sometimes Sophia and Marlon and Sydney Chaplin, Charlie’s son, were in it. What Charlie would do, he would go in, and he would take my role, and he’d act out my part. “He would become my part, Martha. And then with Sophia, he would become Sophia Loren. He would become Marlon Brando. And I was knocked out by it—I thought it was wonderful. “Marlon Brando, however, did not get knocked out [audience laughter]. In fact, Marlon wanted to quit, and Charlie said, ‘No, I don’t think you’re going to do that. You’re under contract.’ And Marlon really put up a fuss about it. 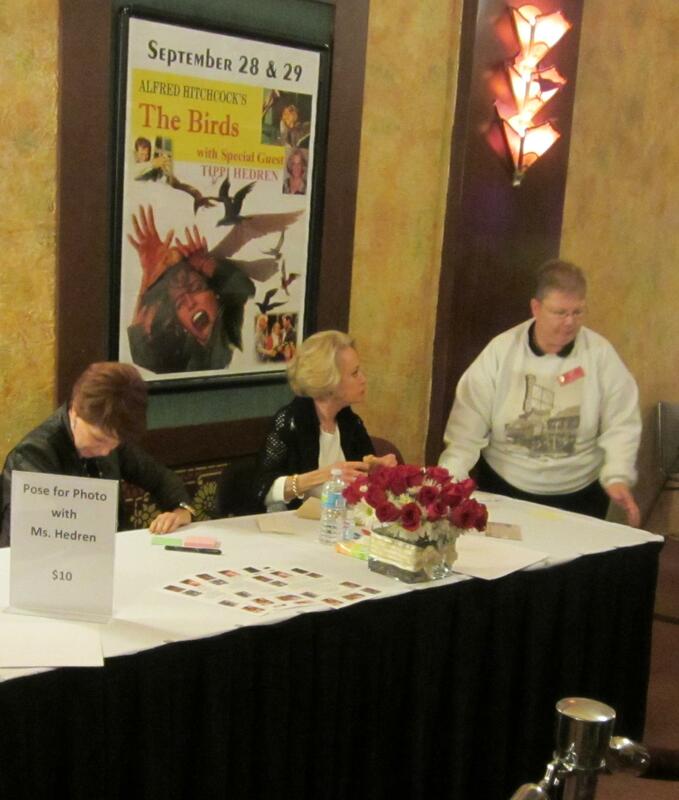 The Redford staff did an excellent job as hosts to Tippi and more than 1,000 patrons. Redford volunteer Linda Sites was given special recognition on stage for her many months of planning and publicizing the event. 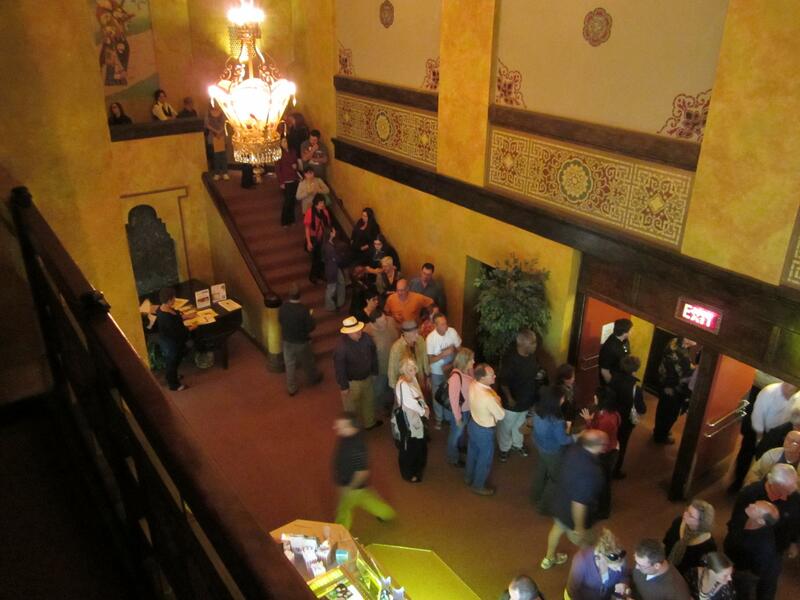 The ticket takers, concession workers, technical staff, security, and others helped keep the crowd orderly and happy. Organist John Lauter energized the audience with his lively selection of pop songs and show tunes. John also played a poignant version of “Moon River,” in honor of singer Andy Williams, who died earlier in the week. Respectful applause followed this tribute. And Mother Nature also did her part on a beautiful fall evening with a full moon, an eerie coincidence with the full moon in The Birds that one character said was a possible explanation for the birds’ misbehavior. Copyright © 2012 by Robert Hollberg Smith, Jr.